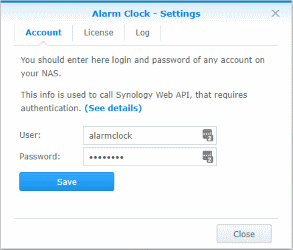 To start at the scheduled time, Synology AlarmClock uses the built-in task DiskStation scheduler. Therefore, you must specify the account with rights for adding tasks to the built-in scheduler. For example, it may be the system administrator account. Click on “Settings” button on the toolbar. A window for entering a name and password for the account will be opened.